I designed and created the arwork for lots of these large (1.2m high) panels for various Amex events worldwide. 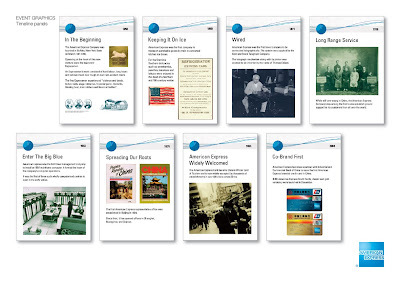 They illustrate Amex's history and achievements since 1850. Once a basic template was designed, the trick was to always vary the layouts as, despite them always appearing in chronological order, not always all of them were used. So I had to be aware that two boards might end up sitting side-by-side and should not look too similar. Images also had to be given different treatments for the same reason.